As the temperatures soar, my levels of tolerance drop. There is a direct correlation between how hot it is and what sort of mood I’m in. There’s also a direct correlation between how hot it is and the number of invites I receive to go places and do things. Those who have suffered the brunt of my intolerance know to keep clear of me if it goes above 35°Celsius and I’m nowhere near water. I can’t help it. I’m just not built for hot weather. My sense of propriety switches off. My ability to let stuff wash over me is drowned in a sea of irritability. My more temperate ‘whatever’ is replaced by a three-letter initialism beginning with the same W. The best of modern minds have failed to find a solution for my weather-related bouts of short-temper. I watch the temperature like fishermen watch the tide and I, too, know when it’s time not to go out. There is hope though. I’ve found one thing that is guaranteed to right the balance, to restore my usual equilibrium no matter how hot it is. And Hungary, at this time of year, has it in abundance. It’s a sunflower – or even better, a field of sunflowers. Ever since I saw the poster for the 2005 movie Everything is Illuminated, with Elijah Wood (Jonathan Safron Foer) standing in a field of sunflowers, I was captivated. I was a couple of years in Hungary before I ventured to the hinterlands of Budapest and saw an actual field of the beauties for the first time. Last week, driving down to Somogyvámos, I had to stop half a dozen times to marvel at the sight. I used to wonder what all the sunflowers were for. Despite the myriad flower stalls dotted around the city, I’m not exactly tripping over these yellow darlings. And there aren’t enough football fans in the country to eat all the sunflower seeds produced (for those of you who haven’t been to a football match involving a Hungarian team, you can tell where the Hungarian fans were sitting – not because of the discarded sweet wrappers or empty beer cans or cigarette butts – you can tell because of the carpet of sunflower seed shells they leave in their wake). 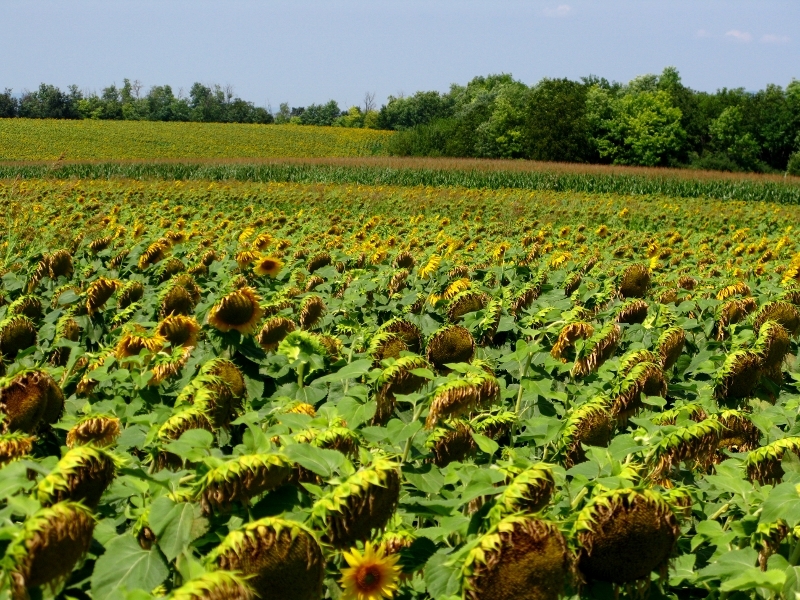 About a half a million hectares is given over to sunflowers in Hungary on which more than 40 different types of sunflower are grown. And hybrids aside, if you take the time to walk among them, you’ll notice how each one is slightly different – some look sad, others thoughtful, others deliriously happy – they’re the most human of flowers. 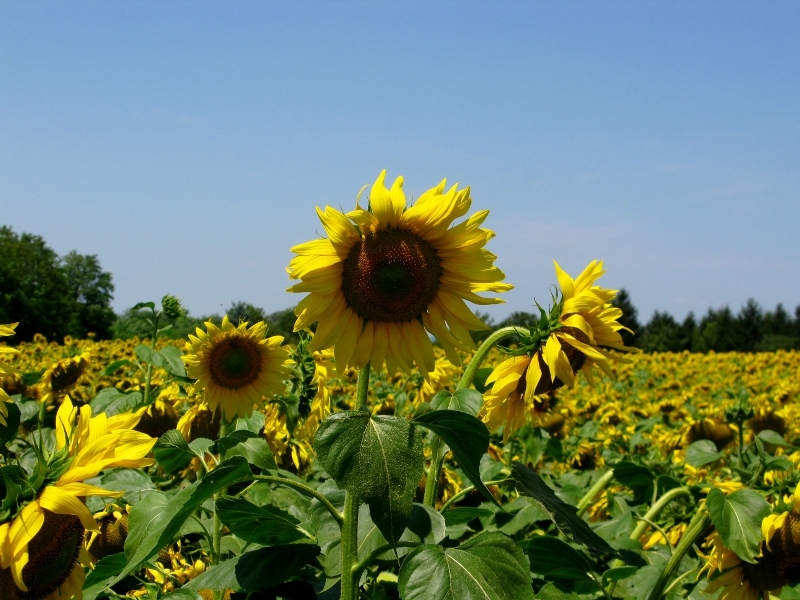 The crop is primarily harvested for oil: hot pressed, extracted, crude, and refined sunflower oil. And it’s used in feed for animals and humans alike, and in cosmetics (such as Hungary’s famous Helia-D). 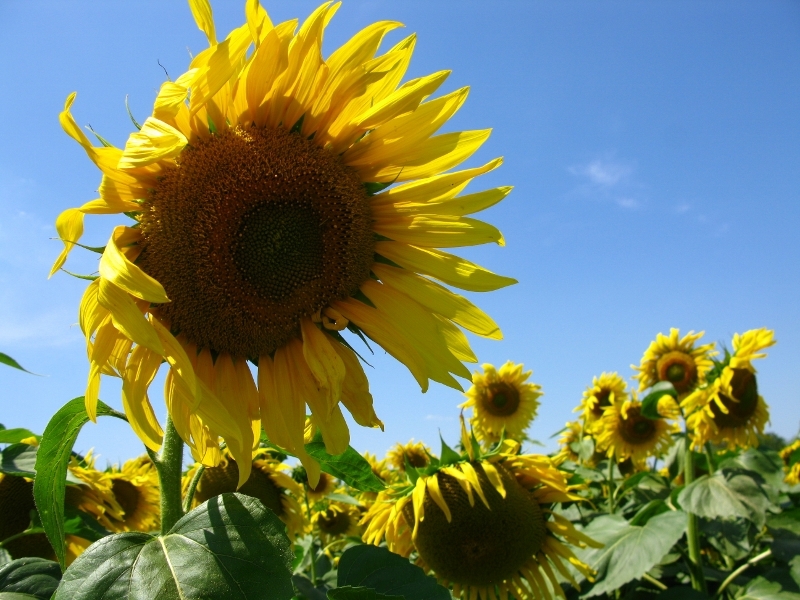 In fact, Hungary is the world’s eighth largest sunflower producer in the world. The tradition has been handed down through generations and sunflower oil is known in the industry as folyékony aranyat (liquid gold). It is said that back in the 1800s, the Russian Orthodox Church had a long list of things that couldn’t be eaten during Lent, including butter and lard. But the sunflower – and its oil – was a relatively new find, and so hadn’t yet made the list. When the Russians discovered they could the oil to cook, the flowers literally blossomed. So, if you want to ask something of me when the temperatures are tipping 30, try first calming the stormy waters with a sunflower or three. I have had sunflower “volunteers” appear in our vineyard from time to time (probably from bird dropping seeds, and normally the rows, as the asile are routeenly mowed). I just let them grow. If nothing else, I just like the way they look. messages) is a wonderful comfort. Hey that describes YOU too!! It is a misconception that flowering sunflower heads track the Sun across the sky during the day. Young flower buds do display movement similar to this behaviour through a process called heliotropism. But a mature flower usually points in a fixed easterly direction.